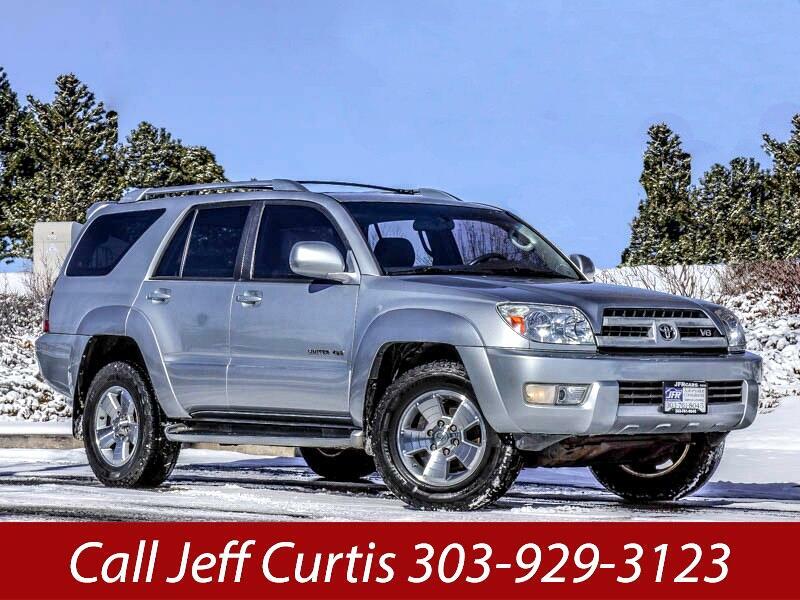 Used 2004 Toyota 4Runner Limited 4WD for Sale in Littleton CO 80120 JFR & Associates, Inc. This well-rounded, affordable, 4Runner loves playing in the dirt or cruising down the highway. The V8 engine provides plenty of power when you need it. Merging in and out of traffic is a breeze, and climbing dirt trails is a snap. This 4Runner comes with your favorite options: MP3 CD player, alloy wheels, heated exterior mirror, rear spoiler, tilt wheel, sunroof, running boards, luggage rack, plus lots more to make your driving experience more enjoyable. Contact us today to schedule a test drive so you can take this baby out for a spin and find out why this 4Runner is so popular. Call Jeff Curtis at 303-929-3123 if you have any questions or if you would like to schedule an appointment to see this vehicle.